A (Arthur) Bertram Chandler was born in Aldershot, England in 1912, Chandler sailed the world in every-thing from tramp steamers to troop transports before emigrating to Australia in 1956. Here he commanded merchant vessels under the Australian and New Zealand Flags up to his retirement in 1974. Up until his death in 1984 he published over 40 science fiction novels and over 200 works of short fiction writing as A Bertram Chandler, George Whitley or Andrew Dunstan. Many of the novels had a nautical theme, with the plot moved from the seas of earth to the ships of space in the future. 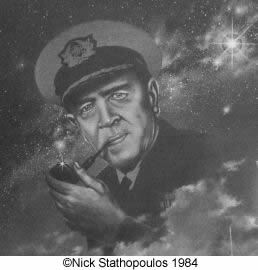 Many of the stories revolved around the character of John Grimes some times referred to as “Hornblower of Space”. While most stories are set in the future, they also have a distinctly “Australian” theme with places and stories relating back to Australia today. Chandler was the last master of the aircraft carrier Melbourne. Law required it to have a master aboard for the months while it was laid up and waiting to be towed off to Asia to be broken up for scrap, so in a sense he really was briefly the master of the Australian navy's former flagship. Apparently he had his typewriter aboard, and worked on his novels! Chandler received four Australian SF "Ditmar" Achievement Awards for his novels. Nearly all of his novels were published in the USA. Two of his short stories 'The Cage' and 'Giant Killer’ are regarded as some of the best SF stories written in the 1950's. He was also very popular in Japan winning the prestigious SEIUN SHO, the premier Science Fiction award. The Japanese editions have some of the best covers of any of the published editions. There are now 31 Novels available as audio books, including all the John Grimes Novels. These are all available from audible.com. The short story I'll take over (originally published as by George Whitely) has been published in the anthology Tales from Super-Science Fiction edited by Robert Silverberg. This short story was published in Science Fiction Stories (May 1957).